Dessert teas are an excellent after-dinner hot drink option that is both decadent and low-calorie. Whether you enjoy the taste of a caramel vanilla tea or something with a fruitier flavor profile like a caramel apple tea, there are a variety of different types that can satisfy your palette. Perfect for after-dinner sipping or as an early-morning indulgence, these aromatic and flavorful dessert teas can satisfy your sweet-tooth without packing on the pounds. One of our favorite tea resources is Art of Tea- the 17 different blends we examine below are Art of Tea blends. Art of Tea focuses on providing top-quality, organically grown teas. They purchase their tea directly from co-ops & small farms internationally, taking pride in providing families in the developing world with a fair price for their goods. Read more about their mission and values here. Besides Art of Tea, we often recommend scouring Amazon.com for dessert teas- there are a variety of tasty options available for purchase. Let's take a look at some of our favorite dessert teas. 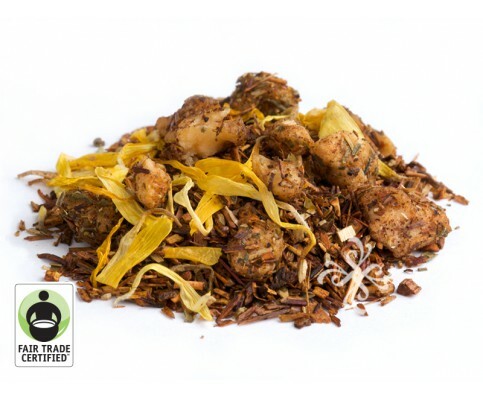 This Butterscotch tea is a sweet tea that is a creamy dessert tea with a buttery and spicy flavor that contains White Tea, Organic Pink Peppercorn, Organic Cinnamon, Organic Marigolds plus Natural and Artificial Flavors with a medium caffeine content. Buyers say it has a buttery warmth that dances on the taste buds. Some users say they are an excellent complement to Russian desserts. 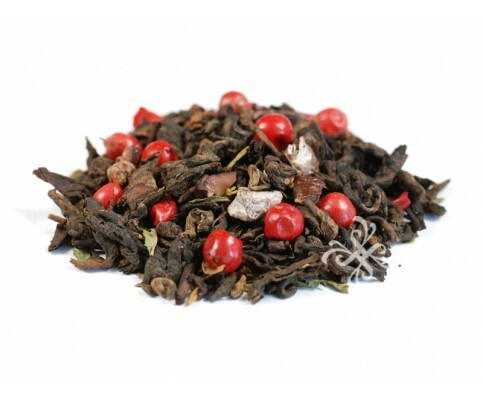 This Dark Chocolate Peppermint tea is a bold, minty and sweet dessert tea that is aromatic and contains Organic Pu-erh Tea, Organic Peppermint, Organic Pink Peppercorn, Organic Cacao Nibs, Natural Flavors and a medium caffeine content. Many buyers say this tea is thick and dark after being steeped and has a cooling chocolate mint flavor that is smooth and comforting. 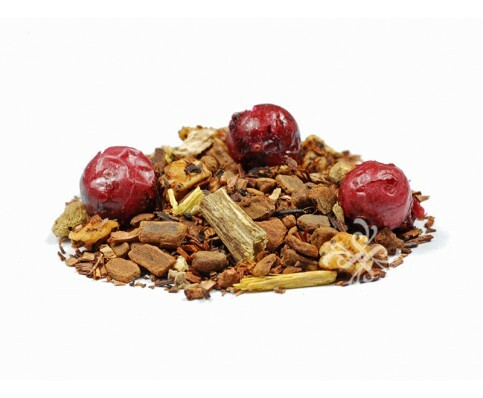 This Cran Marnier tea has a citrus finish and is a dessert tea that contains Organic South African Honeybush, Organic South African Rooibos, Organic Apple Bits, Organic Cinnamon, Organic Licorice Root, Organic Cloves, Organic Cranberries, Organic Nutmeg, no caffeine, Natural and Artificial Flavors. Buys say that it has a unique flavor and a wonderful aroma. 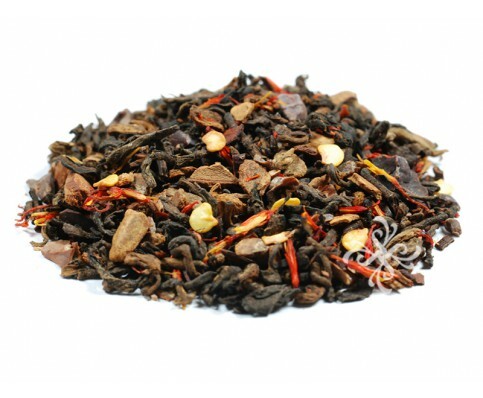 This Pumpkin Pie tea has a savory taste and is a dessert tea that is also sweet and spicy. 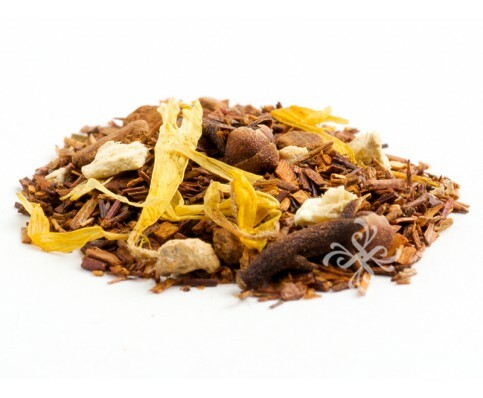 It contains Organic Honeybush, Organic Cloves, Organic Rooibos, Organic Ginger, Organic Cinnamon, Organic Marigolds, is caffeine free and has both Natural and Artificial Flavors. Most buyers love the great aroma and the smooth body of this tea. This Apple Pie tea has a bold and spicy flavor that is a creamy dessert tea that has a hint of coconut and nutmeg and contains Organic Honeybush, Organic Cinnamon, Organic Rooibos, Organic Coconut, Organic Apple Bits, Organic Pink Peppercorn, Organic Ginger, Organic Black Peppercorn, Organic Nutmeg, no caffeine and Natural Flavors. Some buyers find the tea to be quite soothing with a great aroma and smooth body- delicious with classic Russian desserts. This 9:00 PM tea has a sweet, minty and well-rounded taste. 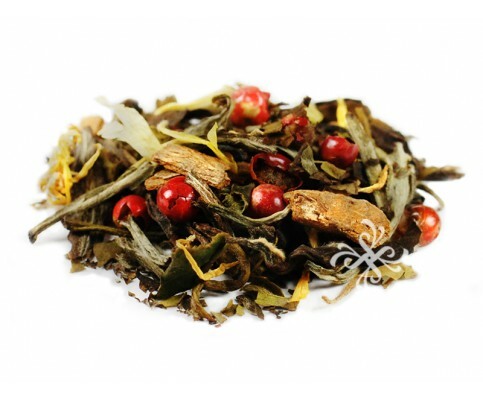 This is a creamy dessert tea that has hints of mint with a creamy finish. It contains Organic Rooibos, Organic Peppermint, Osmanthus Flowers, Organic Spearmint, no caffeine, Natural and Artificial Flavors. Some buyers claim that it’s creamy finish reminds them of a peach cobbler even though there are no peaches in the ingredients. 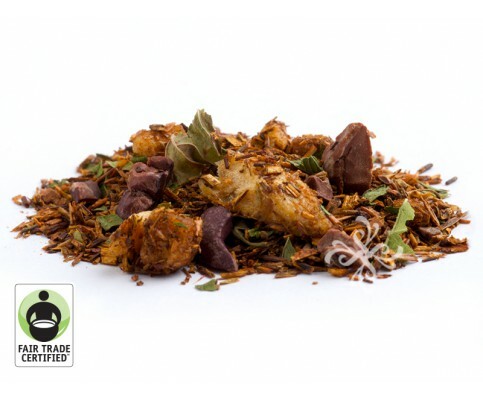 This Cinnamon Fig tea is one that is sweet and spicy and it's a dessert tea that is full bodied. 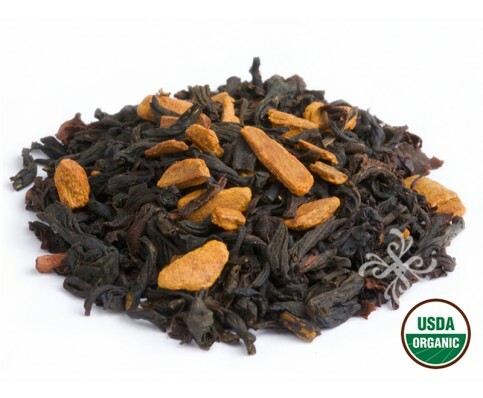 It contains Organic Black Tea, Organic Cinnamon Bits, Natural Flavors and caffeine. Those who have bought this tea say it has a wonderful aroma, smooth body and has a very unique flavor that is both fruity and malty. This Caramelized Pear tea has a fruity taste and is a sweet dessert tea with tones of honey, caramel and freshly baked pears. It contains Organic Honeybush, Organic Marigolds, Organic Rooibos, Organic Apple Bits, no caffeine, Natural and Artificial Flavors. Buyers enjoy its really unique flavor and it's really nice aroma. This Chocolate Monkey tea is a rich combination of sweet silky chocolate and ripe bananas making it a very rich and chocolaty dessert tea. This tea contains Organic Rooibos, Sweet Ground Chocolate (has sugar, cocoa that's processed with alkali, unsweetened chocolate, vanilla and soy lecithin), Organic Honeybush, Banana Bits, Apple Bits, Pink Peppercorn, Cacao Nibs, small amount of caffeine and Natural Flavors. Buyers love the creamy and rich flavor of this dessert tea as well as the great aroma it gives off. 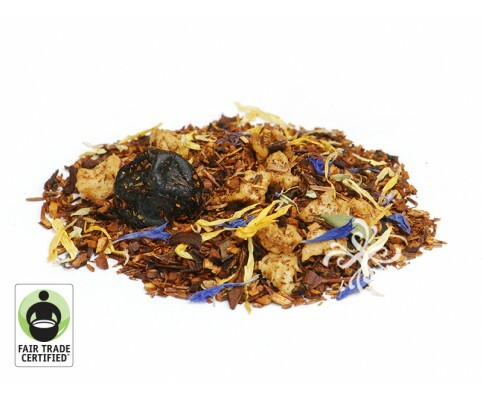 This Lemon Meringue is a tea with a citrus taste and is a creamy and light dessert tea that contains no caffeine, Organic Green Rooibos, Organic Rose Petals, Organic Orange Peel, Organic Cornflowers and Natural Flavors. Those who have bought this tea say it is a soothing tea and has a nice unique flavor with a nice citrus aroma. This Velvet Tea has a minty taste and is a dessert tea with a sweet chocolate/mint that is smooth and creamy. It contains Organic Honeybush, Organic Mint, Organic Rooibos, Organic Apple, Ground Chocolate (sugar, processed cocoa with alkali, soy lecithin, vanilla and unsweetened chocolate), Natural Flavors. Can be purchased as tea bags as well. Buyers like the smooth finish of the tea and how it has a touch of vanilla to top it off. 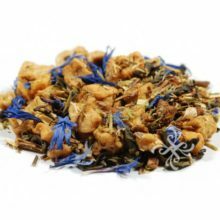 This Blueberry Cheesecake tea has a berry taste and is a dessert tea that is both smooth and creamy. 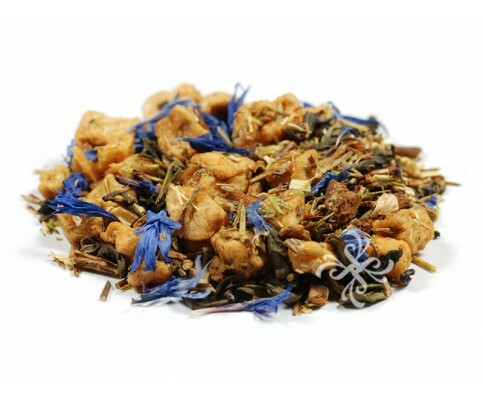 It contains Organic Apple Bits, Organic Rooibos, Organic Honeybush, Organic Blueberries, Organic Cornflowers, Organic Marigolds, no caffeine, Natural and Artificial Flavors. Buyers note that this tea has a soothing affect is high quality and has a really nice aroma to it. 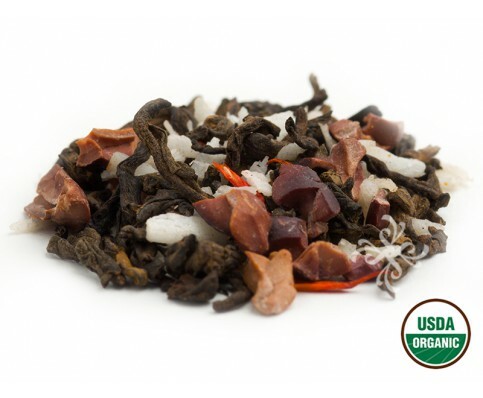 This Coconut Cacao Pu-erh tea is an earthy tea that is a sweet and smooth dessert tea that contains a unique blend of Organic Pu-erh Tea, Organic Coconut Pieces, Organic Cocoa Nibs, a medium amount of caffeine and Natural Flavors. Those who have bought this tea enjoy the smooth, robust and sweet flavor of this tea. They also like the hint of a hazelnut finish. This Banana Dulce tea comes with a malty yet sweet flavor and it's a dessert tea that has notes of ripe banana and coconut. 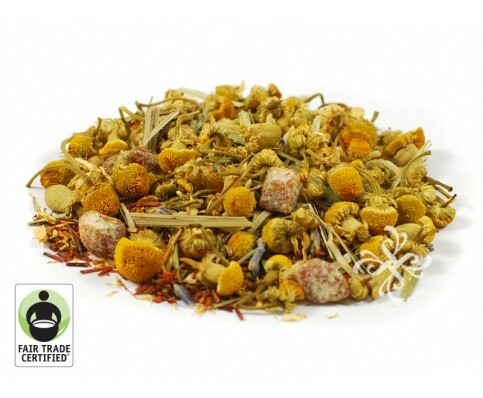 It contains Organic Rooibos, Organic Banana Bits, Organic Chamomile, Organic Lemongrass, Organic Lavender, Organic Coconut Shreds, no caffeine, Natural and Artificial Flavors. Buyers have found the herbal blend of this tea to be soothing that reminds them of a piece of warm banana bread. 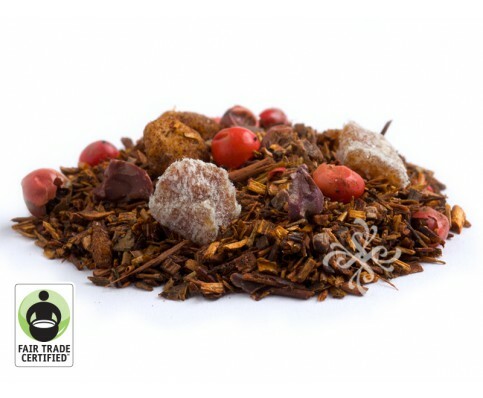 This Aztec Spice is a tea that is earthy and gives this dessert tea a chocolaty and spicy kick to it. 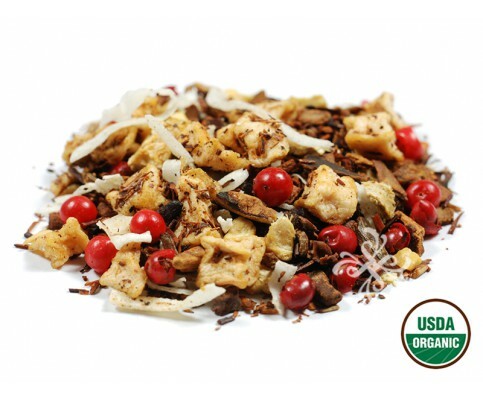 This tea contains a medium amount of caffeine, Organic Pu-reh Tea, Organic Honeybush, Organic Cinnamon, Organic Cocoa Nibs, Sweet Ground Chocolate (sugar, processed cocoa with alkali, soy lecithin, vanilla and unsweetened chocolate), Organic Chile Flakes, Organic Safflower and Natural Flavors. 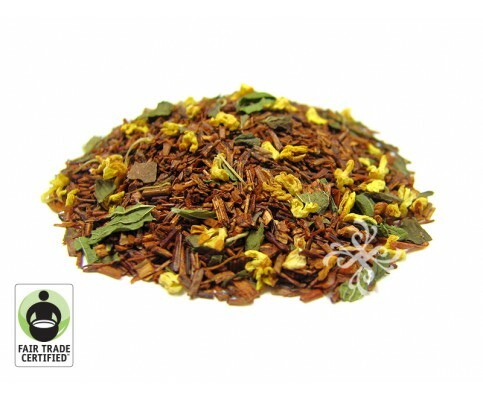 Buyers enjoy the earthy character of this tea and the warm spicy kick that comes from the chili flakes. This Appletea’ni tea has a crisp and fresh taste. 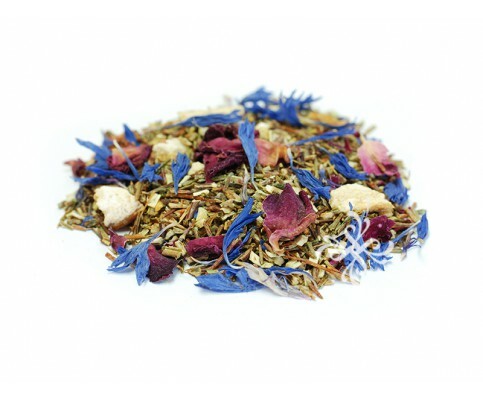 It’s a sweet and fruity tasting dessert tea that contains Organic Green Tea, Organic Green Rooibos, Organic Apple Bits, Organic Ginger, Organic Cinnamon, Organic Cornflower, medium amount of caffeine and Natural Flavors. Those who have bought this tea enjoy the light and fresh taste with a hint of tart green apple flavor. 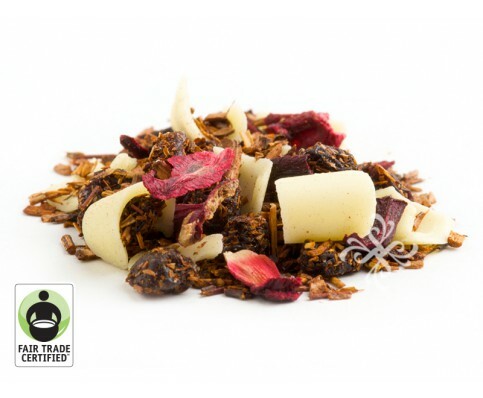 This Vanilla Berry Truffle tea is a tart and creamy dessert tea that contains White Chocolate, Organic Black Currants, Organic Hibiscus, Organic Honeybush, and Natural Flavors. Its buyers say that it is a pleasant blend with the white chocolate flavor more subtle than the hibiscus and currant. One of our favorite dessert tea assortment buys is the Stash tea six flavor pack. It includes decaf chocolate hazelnut, decaf vanilla chai, red velvet, black forest, decaf vanilla nut and decaf pumpkin spice dessert teas. Its creators describe it as a collection of creamy and rich-flavored decaffeinated chai dessert teas that taste great with a little bit of sugar and milk. Users who purchased this collection of chai dessert teas say that the flavors are unique and delicious- many buyers have not been able to locate comparable flavors in their local supermarkets. One buyer says that they are an ideal way to finish off a meal- he recommends adding a little bit of Stevia and milk to complement the flavor. Another buyer that we spoke to says that if you are looking for a caffeine fix that you will not get it from these dessert teas. However, if you want a tasty, low-calorie after-dinner or even early morning treat, these are a solid selection of dessert teas to buy and stock in your pantry. Another reviewer says that he found the vanilla to be a little bit too overpowering for him, and the pumpkin spice felt like more of a seasonal option, while the red velvet flavor did a surprisingly effective job at duplicating the actual flavor of cake. One other buyer observed that these dessert teas smell stronger than they actually taste, which is to say that the tastes are a little bit more milder than the scents. Some buyers enjoy adding sweeteners to these dessert teas while others say that they are sweet enough on their own. Stash is a well known tea brand that many buyers turn to for seasonal and specialty teas, but apparently their dessert teas are not to everybody's liking, with one buyer saying that the flavors felt artificial and were just not palatable. 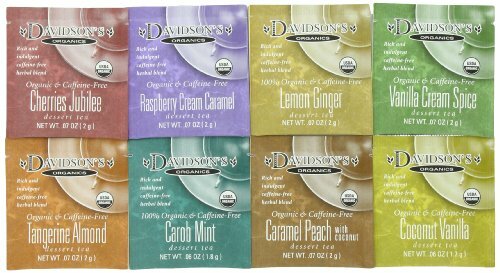 Another brand we like is the Davidsons's single-serve dessert tea collection. This particular collection of caffeine-free teas includes 100 individually wrapped teabags that provide a flavorful fruit and nut character. It should be said, there were some mixed reviews of this particular collection, with one buyer saying that they all taste the same and the flavor wasn't that great. However another buyer said that the different flavors did have a great taste and that he was pleased to discover an organic and caffeine-free option that didn't taste like sawdust. It looks like you'll have to find out for yourself whether this tea does it for you or not- but all buyers at least observed that purchasing in bulk was an economical decision that saved them money instead of purchasing single packs from their local King Kullen or Pathmark. Another bulk tea option we examined was the Custom Varietea tea bag sampler, which includes some dessert and non-dessert options. Among its included flavors are Earl Grey tea, mango delight, jasmine green tea, strawberry sensation, lemon black tea, cherry black tea, coconut mango oolong, kiwi black and thin mint herbal tea. 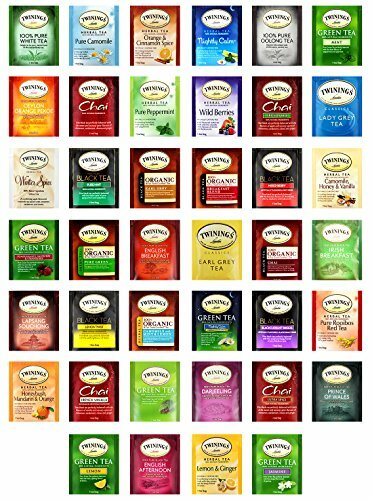 Buyers say that this is a excellent collection of assorted teas for beginning tea drinkers that want to experience a wide variety of flavor profiles that will help them discover the sort of hot drinks they most enjoy. For instance, in this packet you will get a collection of black, green, Ceylon, herbal, white, Earl Grey and oolong teas. Other buyers say that they purchased this collection as a Christmas gift for their family and friends, saying that it was a great way to add some flavor into a loved one's life. If you are just beginning your tea-drinking journey, there are some things you should keep in mind to ensure that you get the best flavor from the experience. Don't make tea and the microwave- while microwaves are really convenient, they do not provide enough control over the temperature of the water. It's really best to use a kettle. You'll also want to experiment with the temperature and steeping time for different teas- read the back of the box to figure out what best practices are for the tea that you are steeping. You should also know that the longer you steep tea the more caffeine content will be in it, so keep this in mind as you are steeping. Invest in some high-quality tea-brewing equipment. You don't need to spend hundreds of dollars, but it's nice to have some quality options- we are fans of the Breville tea maker, for example. Experiment with investing in higher-priced tea leaves. It doesn't make any sense to short shrift yourself on quality so experiment with different options online and in retail stores in your neighborhood. If you are making iced tea, you need to double the amount of tea that is normally used otherwise your drink will end up diluted and unflavorful. Art of Tea is one of our favorite tea-drinking resources- it is a Los Angeles, California-based company that specializes in importing and wholesaling high-quality tea and tea accessories. Art of Tea was founded in 1996 by Steve Schwartz who at the time was deeply invested in the study of higher Vedic and preventative medicine. His tea company, Art of Tea, consequently has developed into one of the best purveyors of specialty and organic teas. Highly regarded as a master tea blender, his different blends have won a variety of awards. Mr. Schwartz is recognized within the industry as a highly skilled and deeply knowledgeable practitioner concerning the health benefits and history of tea. Art of Tea is invested in understanding the origins of the actual distributors and farmers- so they travel throughout India, Asia, Africa, the Middle East researching the best leaves and interacting with farmers on the ground.